This is my new favorite chill-out outfit, a chill-out(fit), if you will. It's got a combination of supersimple pieces that are comfy, easy-to-wash, don't wrinkle, and still look kinda hip. The perfect outfit for drinking coffee on the stoop with a cat. 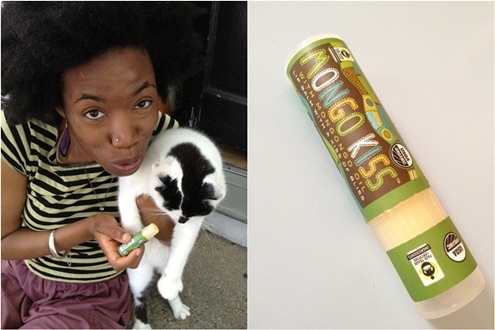 Mongo Kiss: I love it, but the cat isn't a fan. Whatever, she doesn't have lips anyhow! Wanna try Mongo Kiss and try your luck? There's a giveaway for a one year supply on the Eco Lips facebook page now through Monday, May 27. Note: Eco Lips didn't solicit me to write this or provide a free sample. Mongo Kiss is just the best quality and most ethical $2 lip balm I've ever used, so I felt compelled to tell you guys about it. You're adorable! I love your outfit. Looks so comfy. Awww your kitty is so cute! Your hair!! WOW, love it! I can totally see you running around NYC, chic and comfy in this look. Hey Olivia, I usually end up with an organic chocolate bar while waiting in the check-out line at Whole Foods. Eco lip balms sound so much healthier, and probably cheaper, LOL. You look fresh in your outfit today. Very cute! Great shoes. And your kitty is so cute. cute sandals. I'm deciding between something like yours or more of a slip-on/birkenstock style. lovely blog! thanks everyone :-)! i'm feeling the love! Viva WIWW!